Research addressing ecosystem services is rapidly increasing. 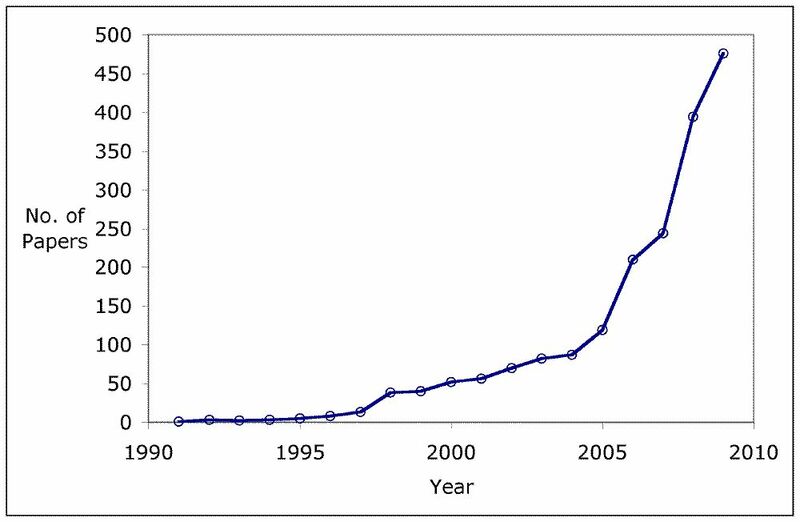 The graph shows increases in the number of papers following publications of Daily’s Nature’s services in 1997 and the MA in 2005. Note: the graph is based on searching ISI web of science using the terms ecological or ecosystem service(s). It includes many papers that mention ecosystem services, but don’t substantially address them. With more than 1 500 citations, the most cited paper on ecosystem services is the controversial 1997 Nature paper by Bob Costanza et al The value of the world’s ecosystem services and natural capital. The most cited paper published between 2000-2004, with over 400 citations, was David Tilman et al’s 2001 Science paper Forecasting agriculturally driven global environmental change. While the most cited paper published between 2005-2009, with more than 300 citations, was the controversial paper (but not for its ecosystem service part) was the Boris Worm et al Science paper Impacts of biodiversity loss on ocean ecosystem services.